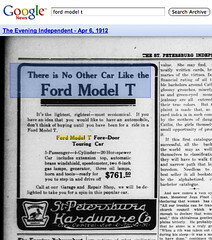 Yesterday, Google announced that they are bringing in searchable scans of newspapers into Google News Archive Search. It allows you to search news, headlines, content, and even ads! 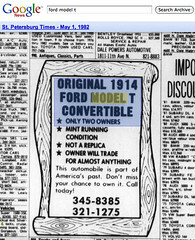 Here are two ads for a Ford Model T, one from April 1912 for about $750 and a more recent ad from May 1982 selling it as a vintage car (no price listed). How incredibly useful! Google said they will continue to scan papers and make them searchable.